The use of computational models in the frame of environmental topics is as its early stages. 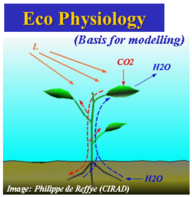 Mechanistic modelling of plant growth is thus a relatively recent research field. Seminal works date back to De Wit (De Wit et al., 1970) and Monteith (Monteith and Moss, 1978) in the seventies, with early models of the functioning of crop canopies. Several important families of models directly inherit from those concepts: CERES (Jones et al., 1983), WOFOST (Diepen et al., 1989), STICS (Brisson et al., 1998) or APSIM (Keating, 2003). These models share large conceptual similarities: they are generic, aiming to model a wide variety of crops, they only consider the functioning of the canopy and not of the individual plants and they give a very detailed description of plant-environment interactions, with a focus on the effects of environmental stresses (water, temperature, Nitrogen …) on crop growth. As such, they became interesting support for the management of agricultural systems. Limitations of these models result from the fact that plants are not modelled as individuals, but as a continuous medium. If at the first order, this approach is sufficiently robust for relatively homogeneous crops, it cannot properly handle canopies characterized by a strong inter-individual variability or species characterized by a very strong plasticity (trees or herbaceous plants for example ...), since the proper scale at which this plasticity is expressed is at the individual plant scale. Plant architecture was shown to be a key component for the expression of this plasticity (Fourcaud et al., 2008). 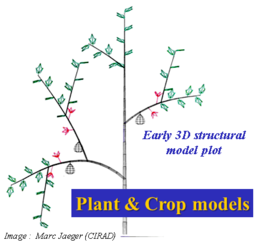 In parallel to the development of crop models, geometrical models of plants also emerged. They describe plants at the individual scale, and their first objective is a realistic visual rendering of plant architecture (De Reffye et al., 1988; Prusinkiewicz et al., 1988). 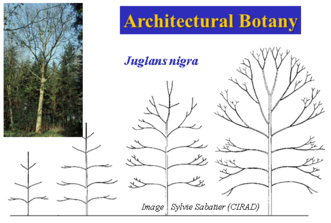 These models have benefited from the progress in conceptual botany with the architectural analysis of trees and the introduction of botanical models by Halle and colleagues (Halle et al., 1978), as well as from the breakthroughs in computer graphics and computational performances in the eighties. These geometrical models found some utility in the computer graphics industry, like video games or architecture, urban planning software. However, the underlying models do not consider plant growth as the result of its biological functioning, which is of course prohibitive for broader applications, in forestry or agriculture. Quite naturally, these two approaches – geometrical and functional – converged to the creation of the so-called functional structural plant models, with a key conference in 1996, the “Helsinki Workshop on Functional-Structural Tree”, and a special issue in Silva Fennica 1997, with all the early works of the emerging community (see in particular Sievanen, Kurth, De Reffye, Prusinkiewicz, Ford and colleagues …). Applications in forestry, agronomy, genetics, etc. In this context, we propose hereby a set of digital resources dedicated to promote the sciences and technologies upon which relies plant growth modelling: model design with the biological concepts in plant architecture and functioning, numerical simulation, model evaluation with statistical methods, and visualization. 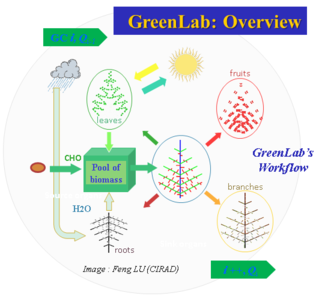 For this purpose, the teaching resources are organized around the GreenLab model (De Reffye and Hu., 2003) which is used to illustrate the different concepts and as the basis for the practical examples. 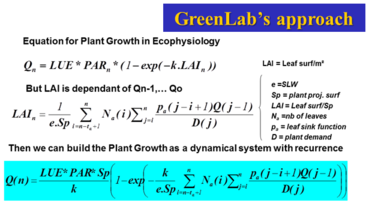 The interest of the GreenLab model relies on its mathematical formulation as a dynamic system (Cournède et al., 2006) which allows efficient simulations, proper statistical identification and evaluation, but also an easy integration of the concepts classically used in crop models to describe plant-environment interactions. GreenLab moreover benefits from performing 3D visualization tools. The resource may interest students, teachers, researchers, professionals from various disciplines with a scientific background, showing interest in multi-disciplinary approaches. This formalism shows 30 year of multi-disciplinary experience in agronomy, applied mathematics and computational approaches involving CIRAD, China Agricultural University, Chinese Academy of Sciences, University of Wageningen and Ecole Centrale Paris, partners of this proposal. Acquire the ground concepts in Plant growth and development at individual plant level, for studies related to agronomy and sustainable environment. Mobilize those concepts and their related tools on applications at crops and stands levels. 1. Initiate learners to botanical notions describing plant architecture. 2. Show that the plant production is a complex dynamic interaction between a space conquer strategy and environmental resource availability, water in particular. 3. Understand the crop modelling approaches principles and perceive the interest of those involving structural aspects. 4. Understand and operate a specific mathematical Functional and Structural Plant Model, which shows the capability to be reversed, allowing thus production optimization towards defined targets. 5. Master advanced analysis and simulation tools in order to characterize, and quantify the meaningful variables driving the biomass production dynamics at plant level in crops and stands (in specific environmental conditions). 6. For teachers, those resources deliver contents to build various pedagogic paths, from a simple introduction to plant modelling principles up to the capability to mobilize advanced simulation and calibration tools to understand the plant growth and development dynamics. Two levels of resources are distinguished. Fundamentals (elementary notions in architectural Botany, physiological assumptions for production, mathematical notions for organ competition definition and calibration, overview of plant and crop models) define the first level. 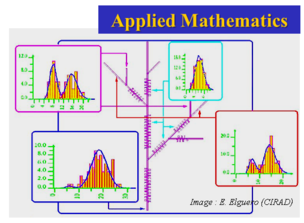 Second level introduces modelling approaches and functional structural models specificities before focusing on GreenLab model definition and applications. Theoretical approach, examples and interactive exercises define the frame of a unit. Those can be combined to build various pedagogic paths for graduate, master courses or doctoral options. The resource set includes study cases and exercises involving simulations and calibration tools with their respective measurement protocols and dataset. Resources language is English, under pdf and html format. Software tool are available on line, and operative with an easy to use installation, including technical tutorial, specific and unit contextual dataset and interfaces. Hallé, F., Oldemann, R.A.A., Tomlinson, P.B. 1978. Tropical trees and forests. Berlin: Springer-Verlag. Jones, C. A., Ritchie, J. T., Kiniry, J. R., Godwin, D. C., Otter, S. I. 1983. The CERES wheat and maize models. Minimum Data Sets for Agrotechnology Transfer, 95 p.
Jones, C.A., and J.R. Kiniry. 1986. CERES-Maize : a simulation model of maize growth and development. Edited by C.A. Jones and J.R. Kiniry. College Station : Texas A&M University Press, 1986. 194 p.
De Wit, C. D., Brouwer, R., Vries, F. D., Setlik, I. 1970. The simulation of photosynthetic systems. In Prediction and measurement of photosynthetic productivity. Proceedings of the IBP/PP Technical Meeting, Tfebon,[Czechoslovakia], 14-21 September, 1969. Wageningen, Netherlands, PUDO, pp. 47-70.